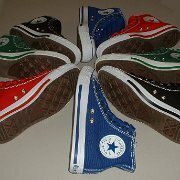 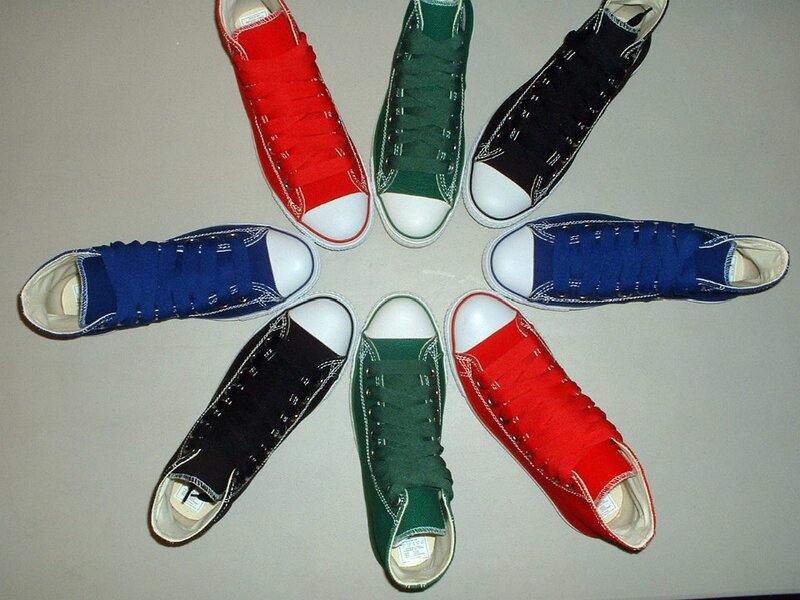 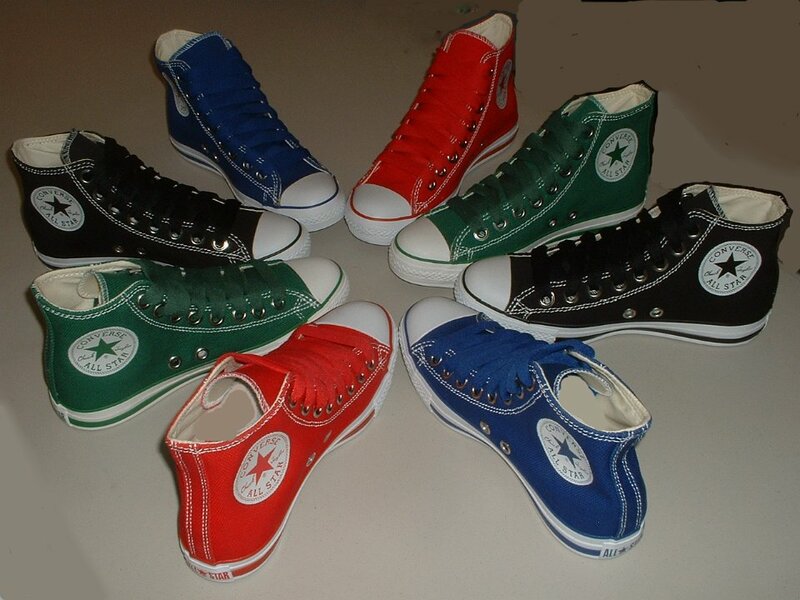 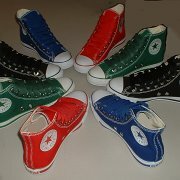 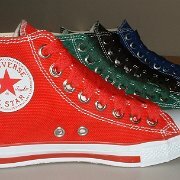 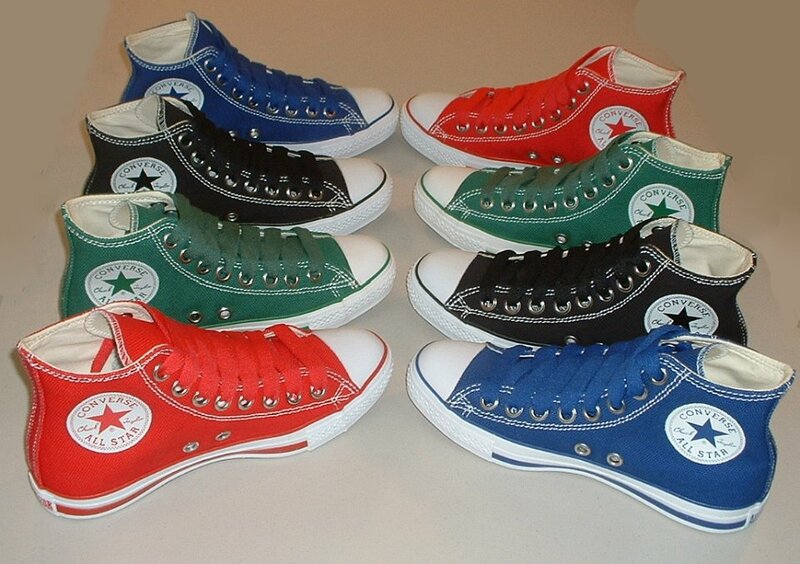 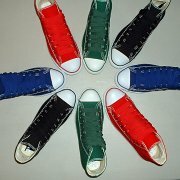 Photo gallery of simple details high top chucks in various colors. 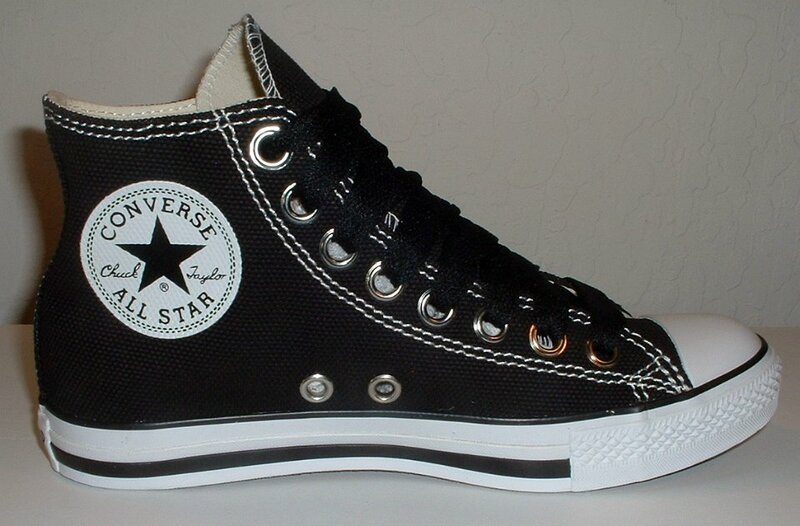 1 Simple Details High Top Chucks Inside patch view of a right black simple details high top. 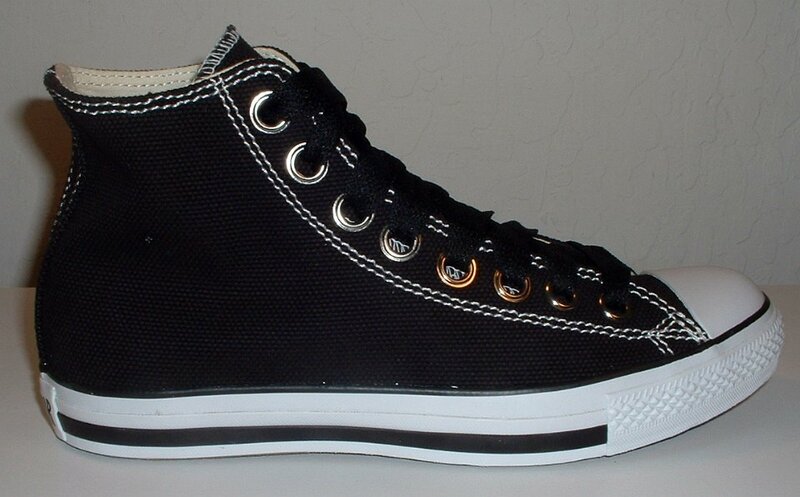 2 Simple Details High Top Chucks Outside view of a right black simple details high top. 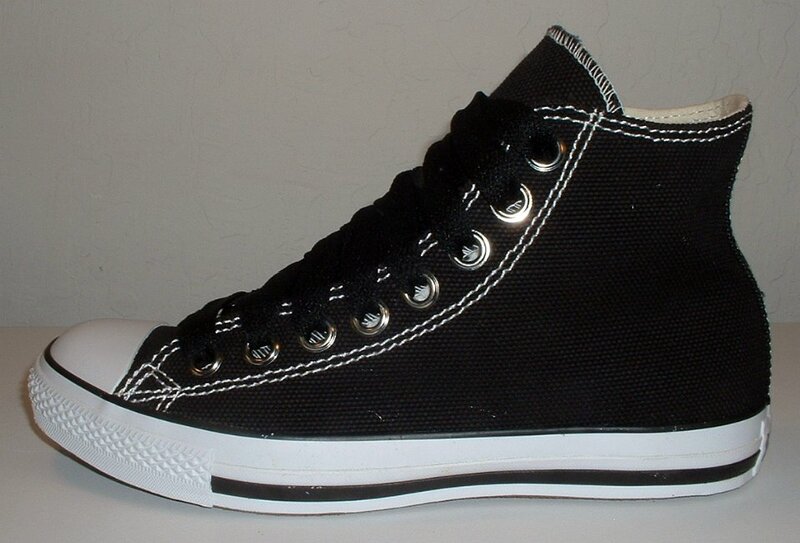 3 Simple Details High Top Chucks Inside patch view of a left black simple details high top. 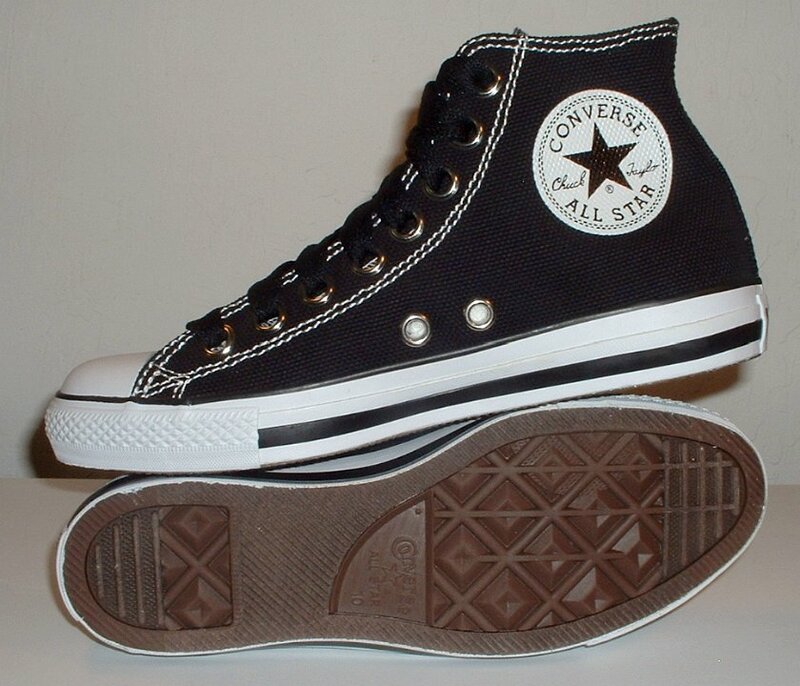 4 Simple Details High Top Chucks Outside view of a left black simple details high top. 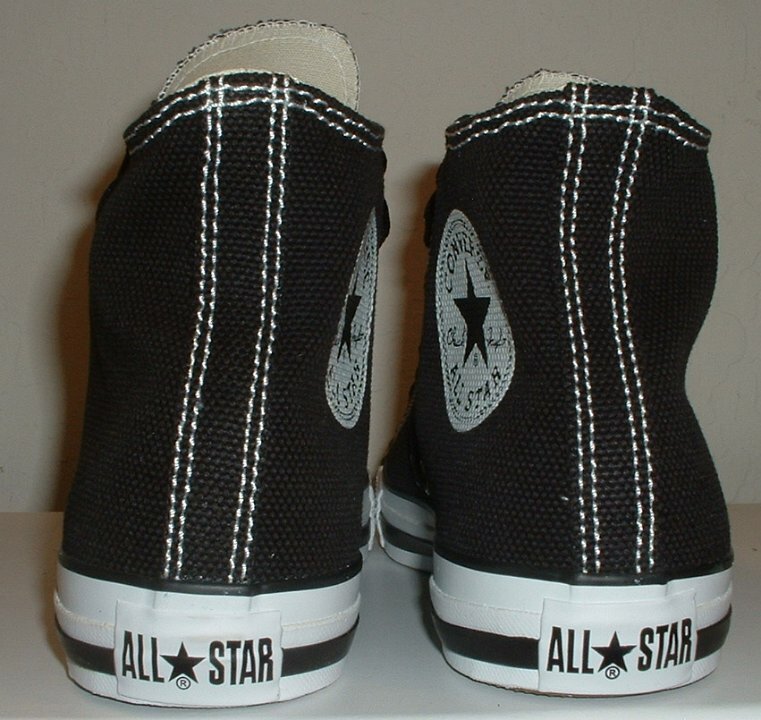 5 Simple Details High Top Chucks Rear view of black simple details high tops. 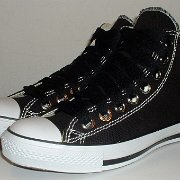 6 Simple Details High Top Chucks Front view of black simple details high tops. 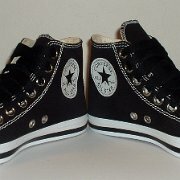 7 Simple Details High Top Chucks Angled side view of black simple details high tops. 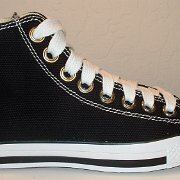 8 Simple Details High Top Chucks Top view of black simple details high tops. 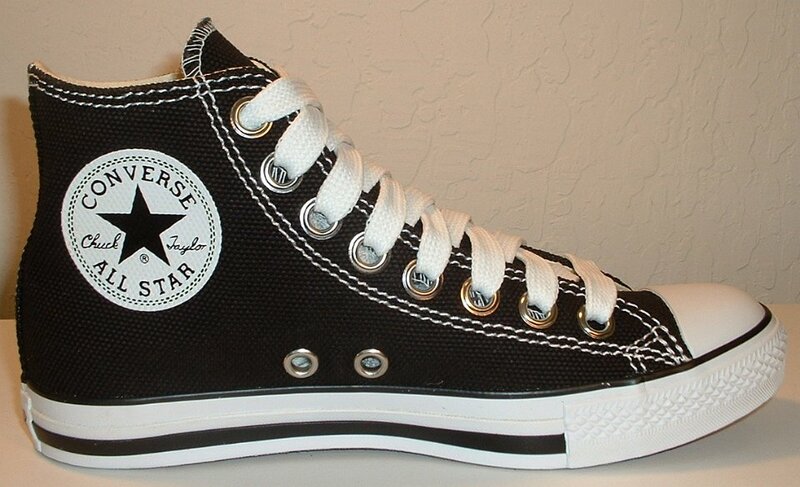 9 Simple Details High Top Chucks Inside patch views of black simple details high tops. 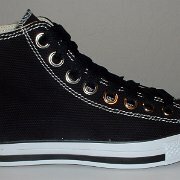 10 Simple Details High Top Chucks Angled front view of black simple details high tops. 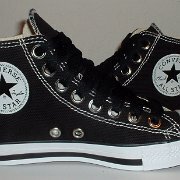 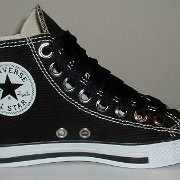 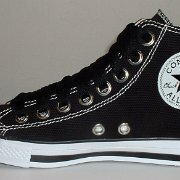 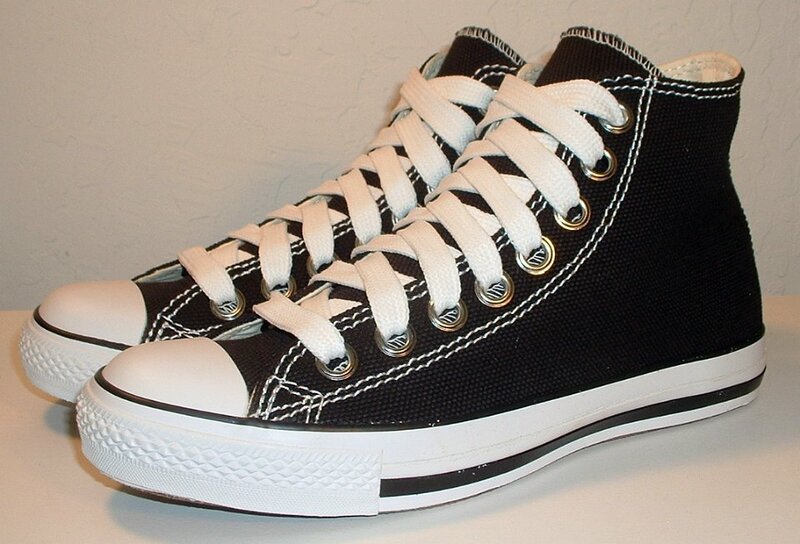 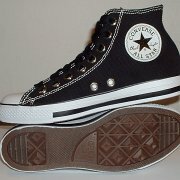 12 Simple Details High Top Chucks Inside patch view of a right black simple details high top with wide white laces. 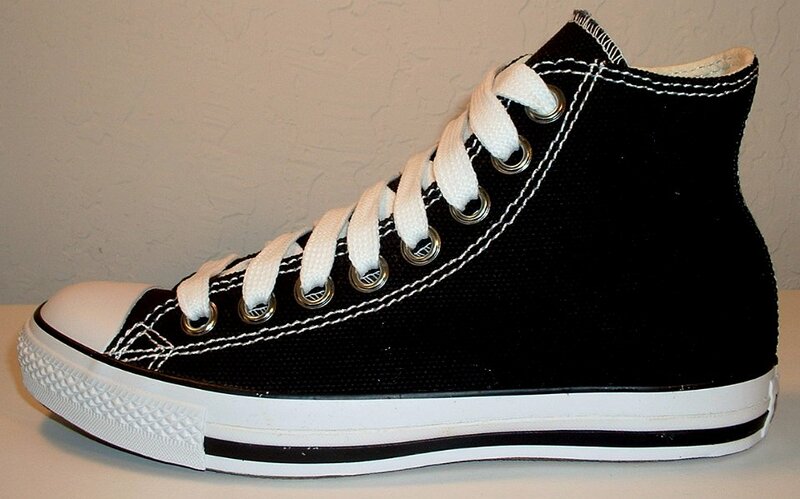 13 Simple Details High Top Chucks Outside view of a right black simple details high top with wide white laces. 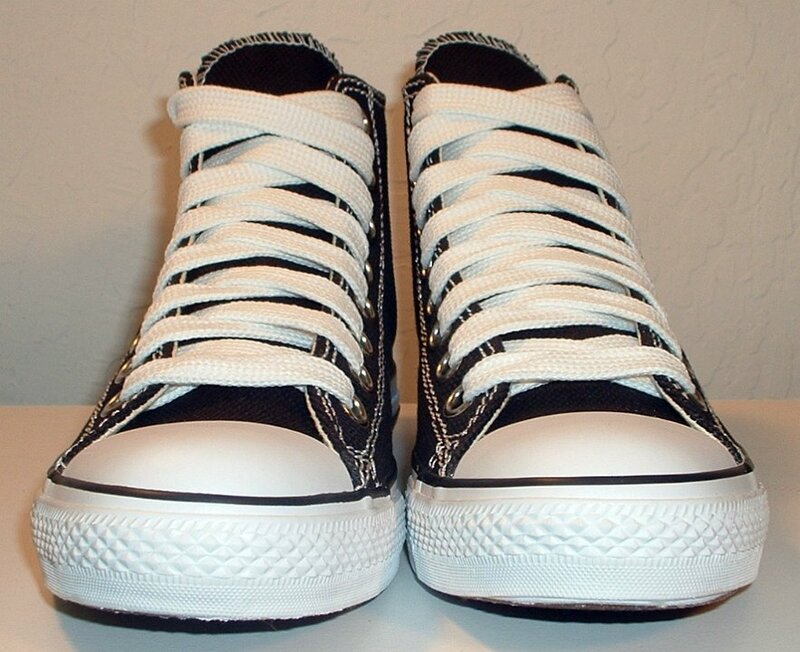 14 Simple Details High Top Chucks Outside view of a left black simple details high top with wide white laces. 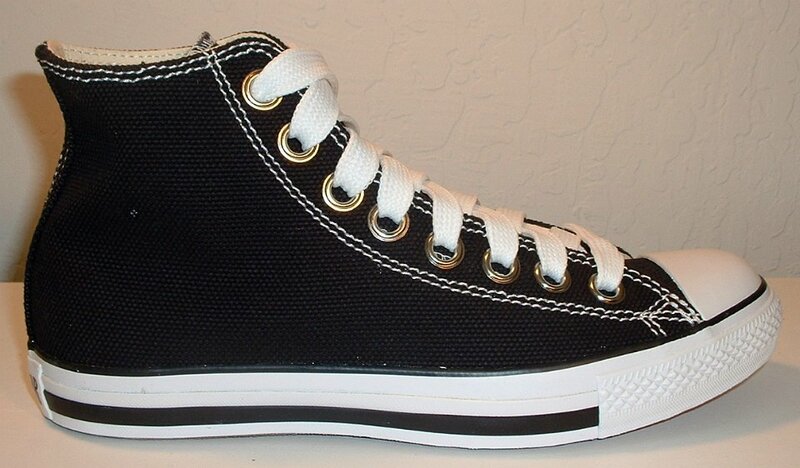 15 Simple Details High Top Chucks Inside patch view of a left black simple details high top with wide white laces. 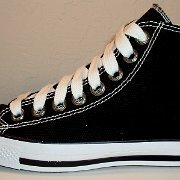 16 Simple Details High Top Chucks Front view of black simple details high tops with wide white laces. 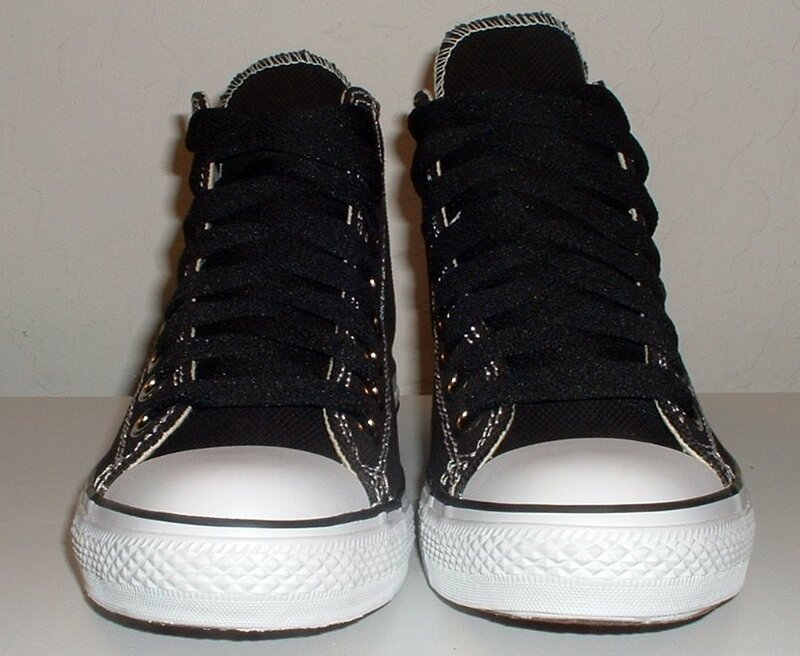 17 Simple Details High Top Chucks Angled side view of black simple details high tops with wide white laces. 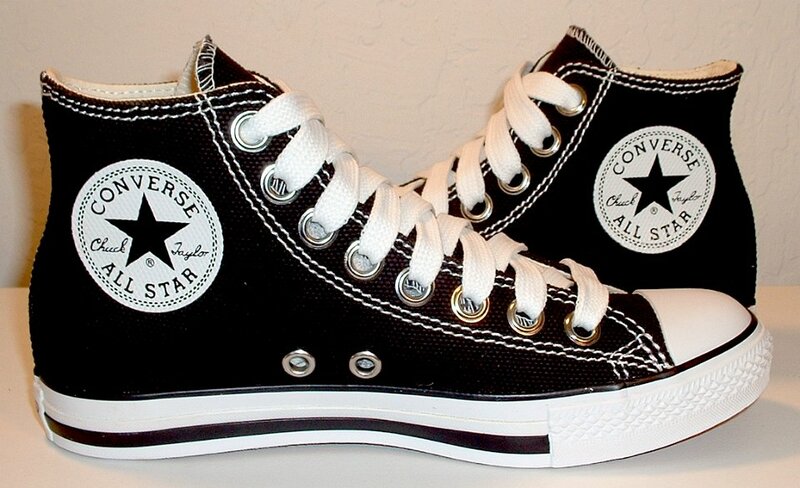 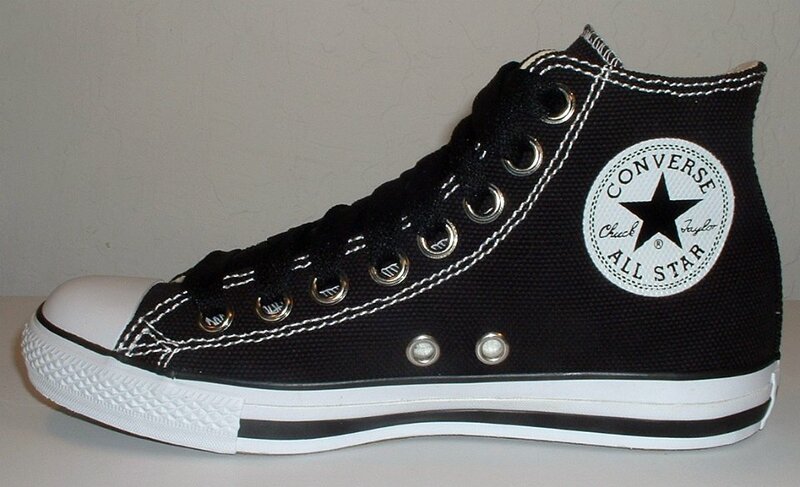 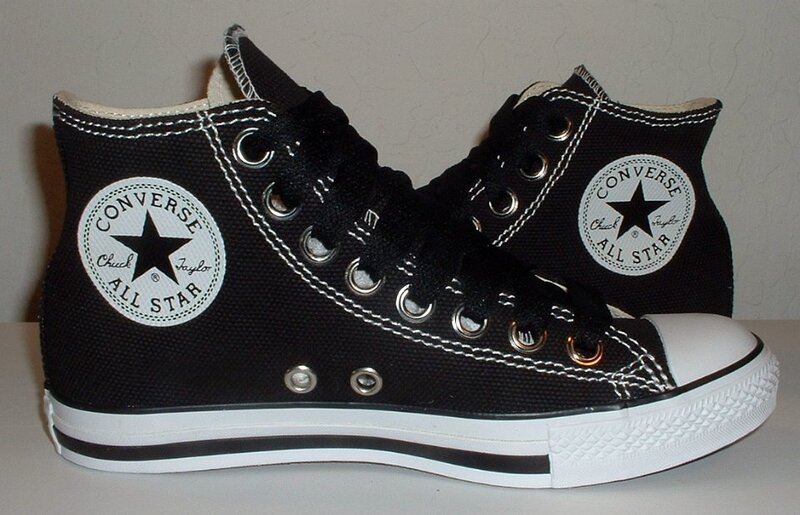 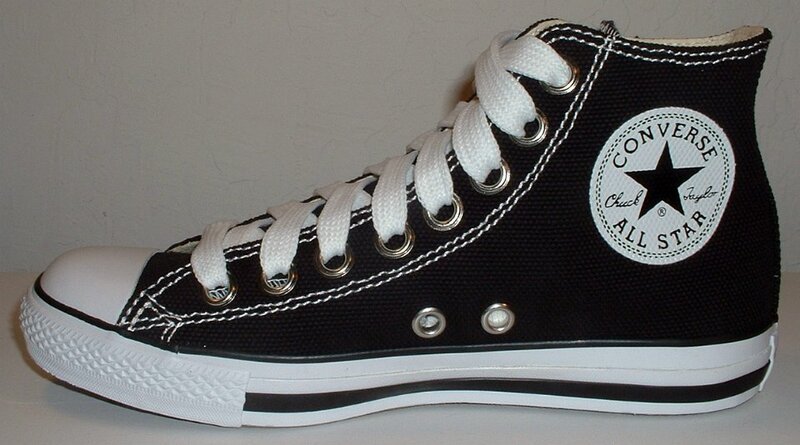 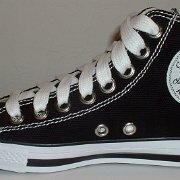 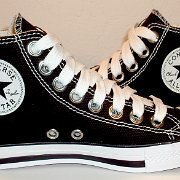 18 Simple Details High Top Chucks Inside patch views of black simple details high tops with wide white laces. 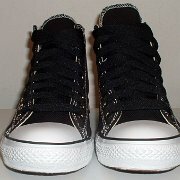 19 Simple Details High Top Chucks Top view of black simple details high tops with wide white laces. 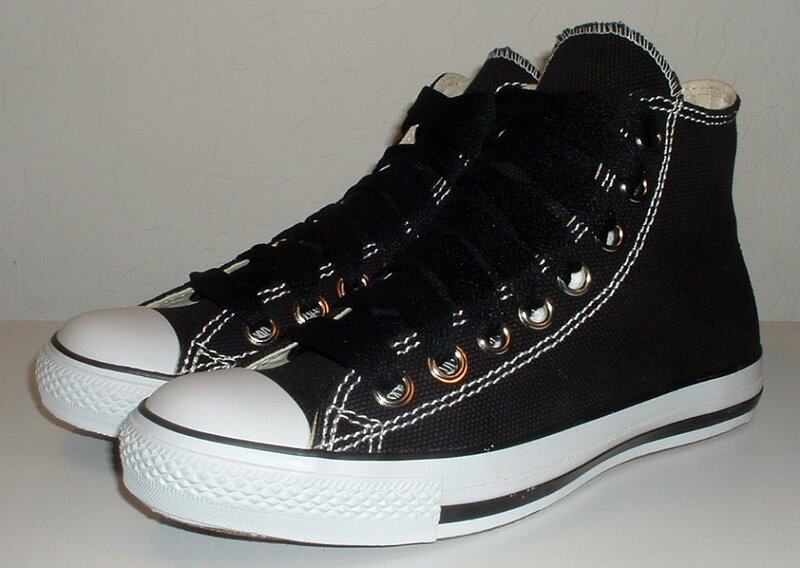 20 Simple Details High Top Chucks Angled front view of black simple details high tops with wide white laces. 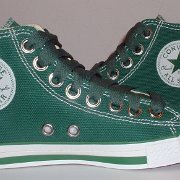 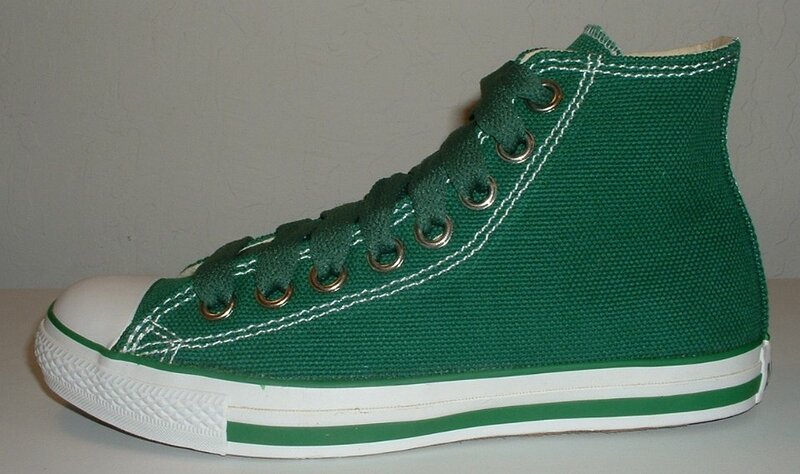 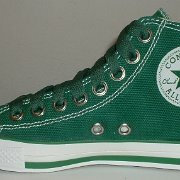 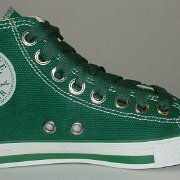 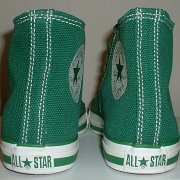 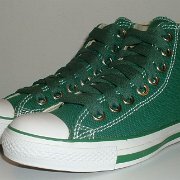 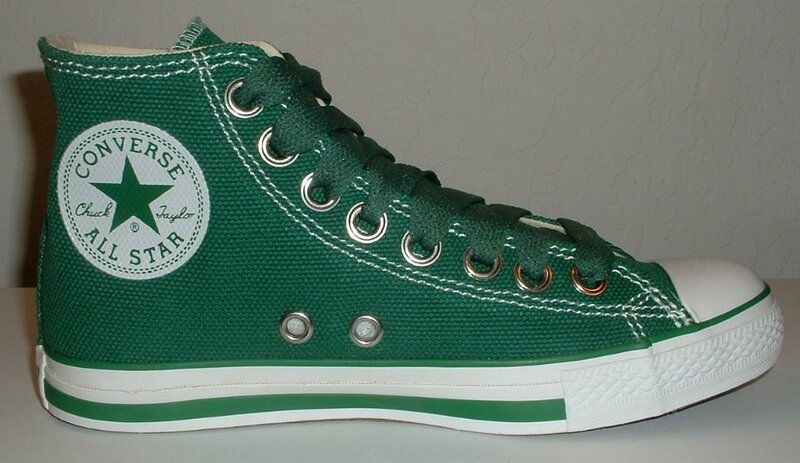 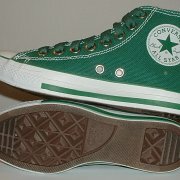 21 Simple Details High Top Chucks Inside patch view of a right green simple details high top. 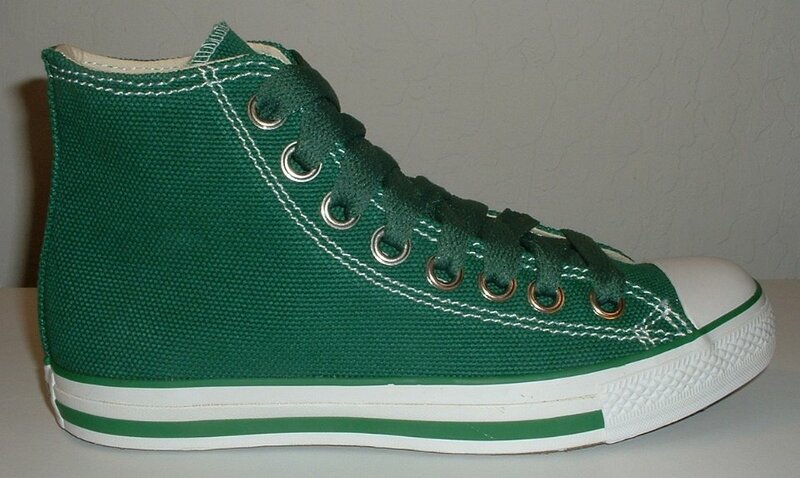 22 Simple Details High Top Chucks Outside view of a right green simple details high top. 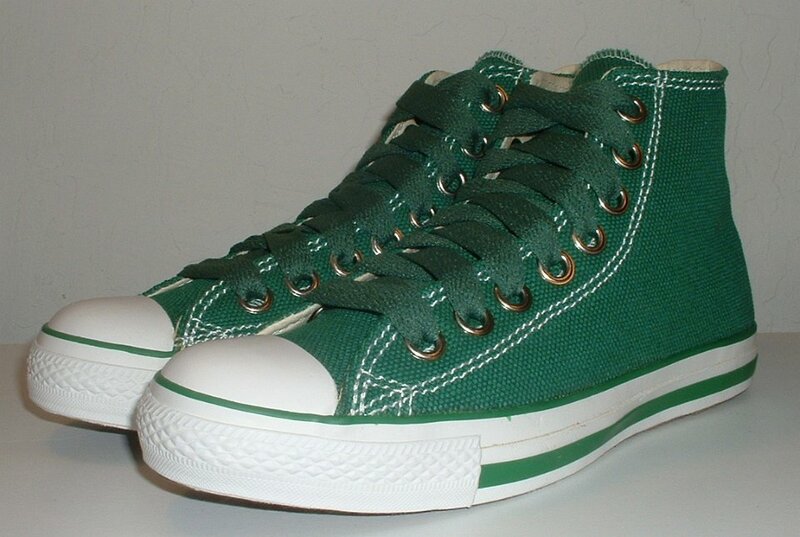 23 Simple Details High Top Chucks Inside patch view of a left green simple details high top. 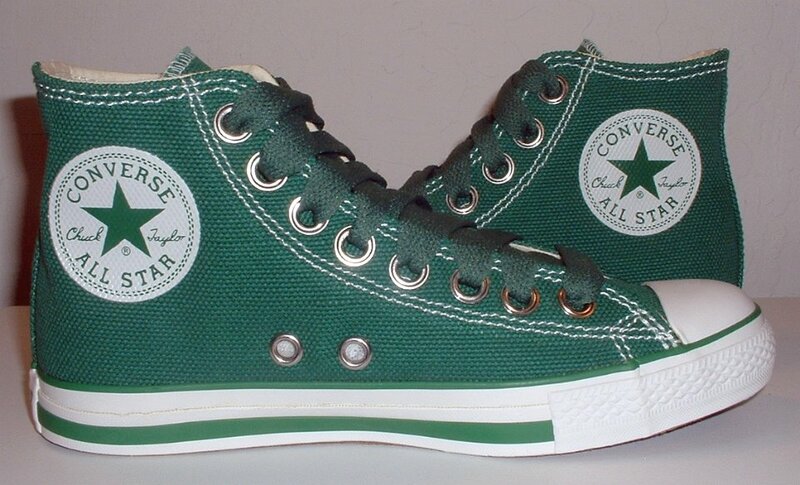 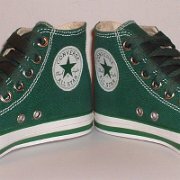 24 Simple Details High Top Chucks Outside view of a left green simple details high top. 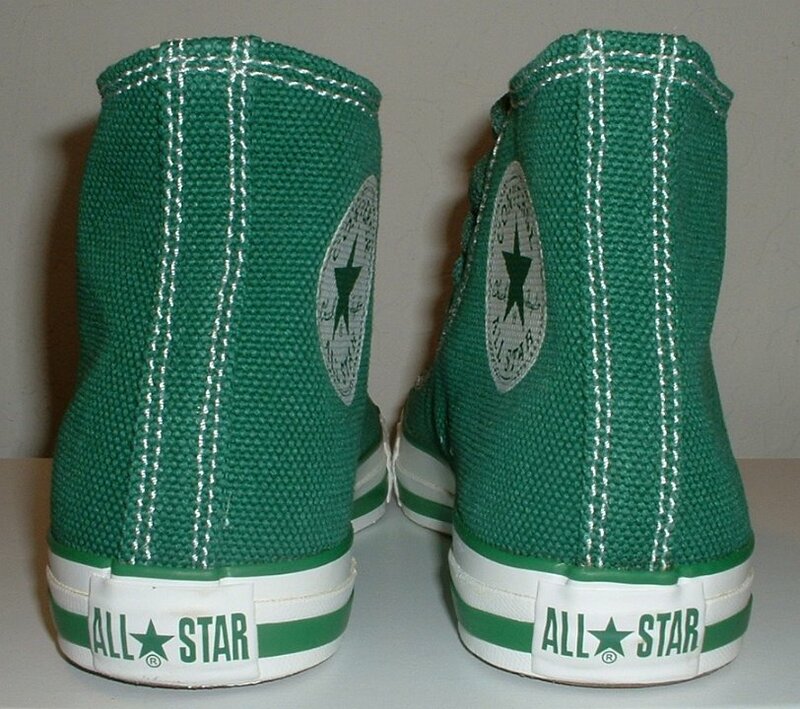 25 Simple Details High Top Chucks Rear view of green simple details high tops. 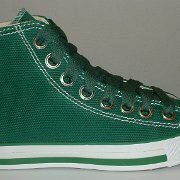 26 Simple Details High Top Chucks Front view of green simple details high tops. 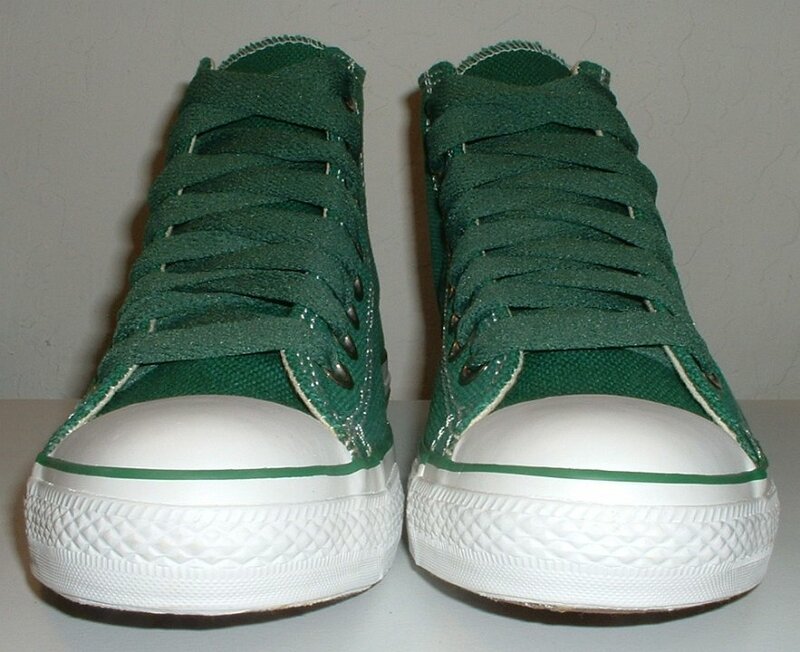 27 Simple Details High Top Chucks Angled side view of green simple details high tops. 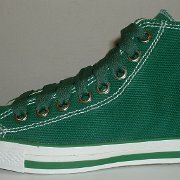 28 Simple Details High Top Chucks Angled front view of green simple details high tops. 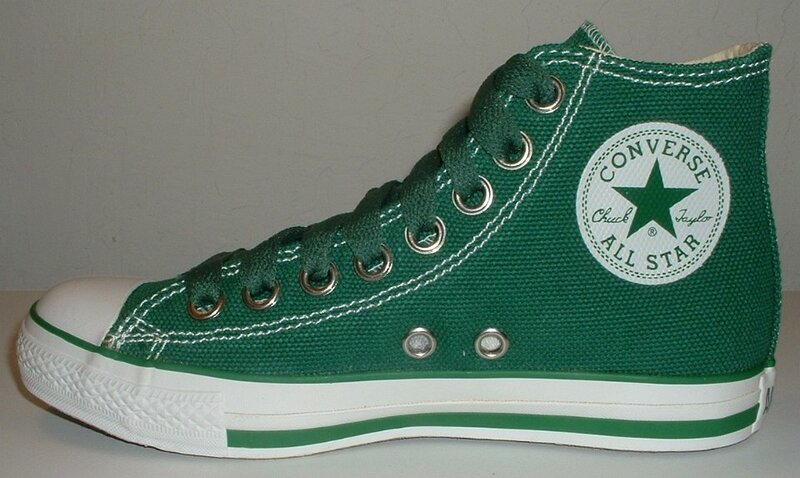 29 Simple Details High Top Chucks Inside patch views of green simple details high tops. 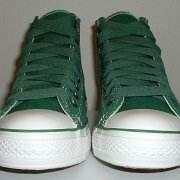 30 Simple Details High Top Chucks Top view of green simple details high tops. 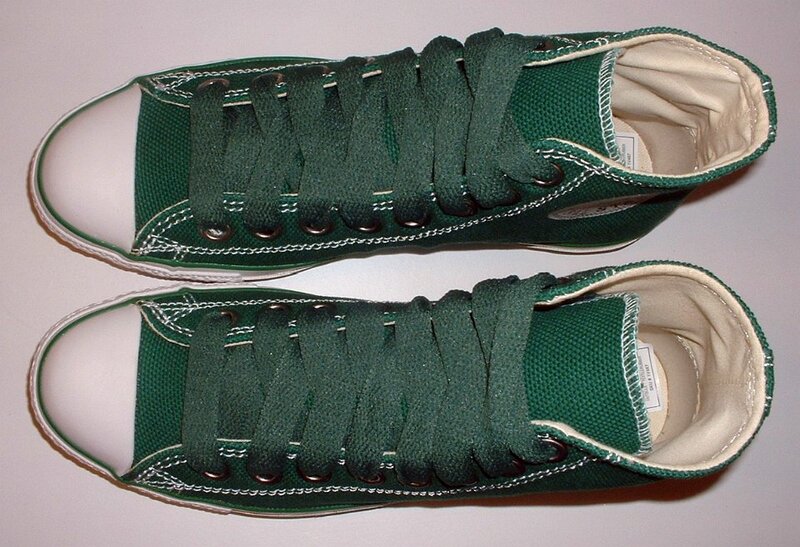 31 Simple Details High Top Chucks Inside patch and sole views of green simple details high tops. 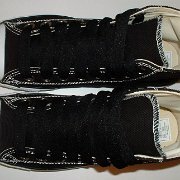 32 Simple Details High Top Chucks Group inside patch shot of simple details high tops. 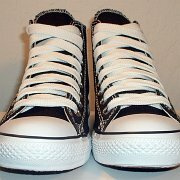 33 Simple Details High Top Chucks Row of simple details high tops. 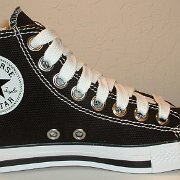 34 Simple Details High Top Chucks Row of simple details high tops. 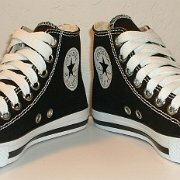 35 Simple Details High Top Chucks Circle of simple details high tops. 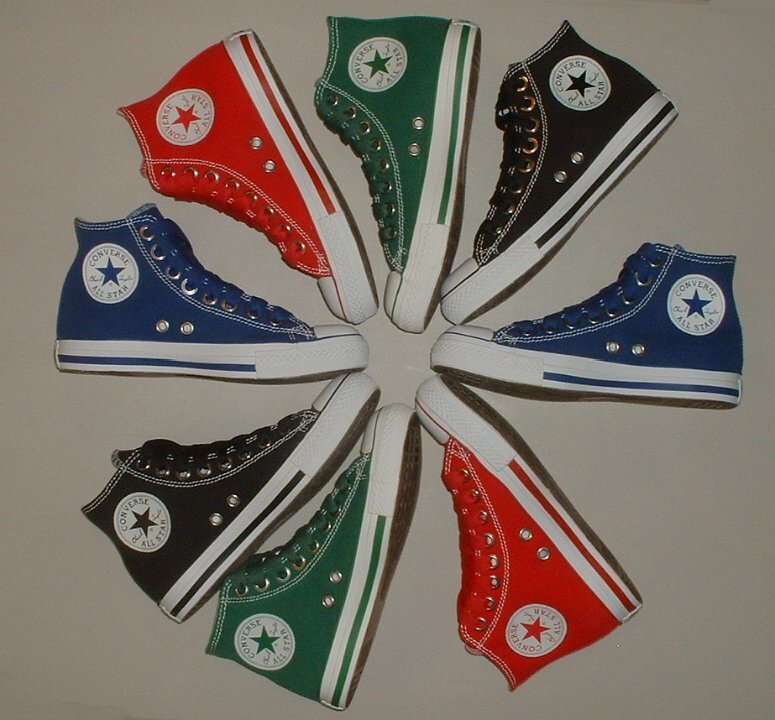 36 Simple Details High Top Chucks Circle of simple details high tops. 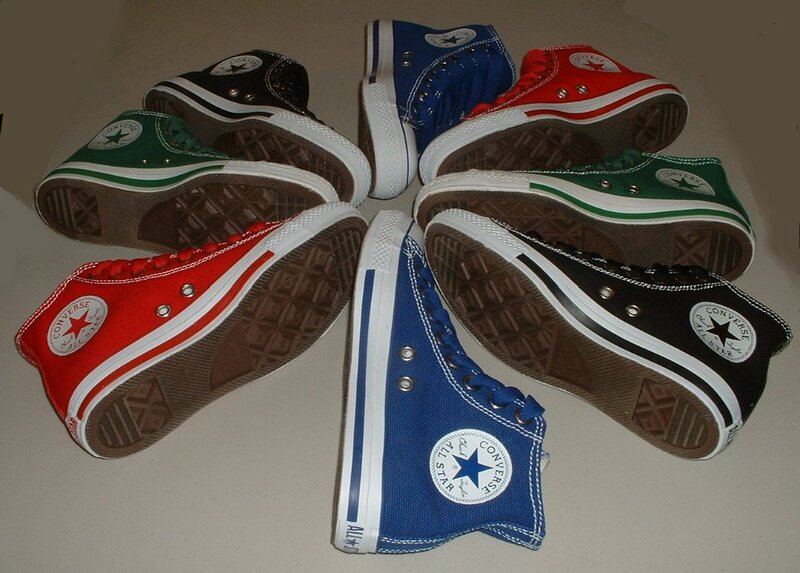 37 Simple Details High Top Chucks Top view of a circle of simple details high tops. 38 Simple Details High Top Chucks Siideways circle of simple detail high tops. 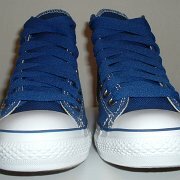 39 Simple Details High Top Chucks Top view of a sideways circle of simple detail high tops. 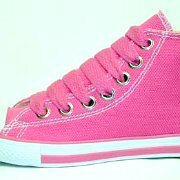 40 Simple Details High Top Chucks Angled inside patch view of a left pink simple details high top. 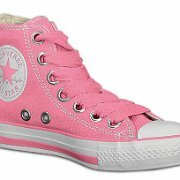 41 Simple Details High Top Chucks Front and sole views of pink simple details high tops. 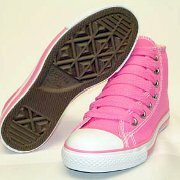 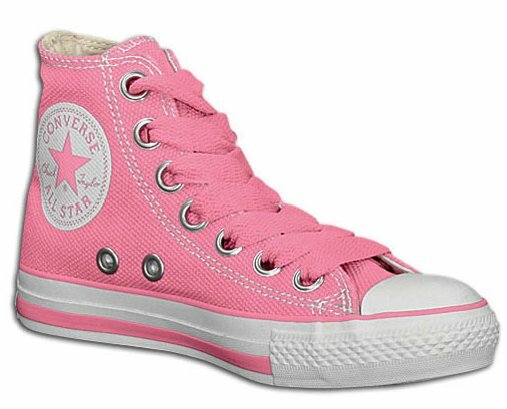 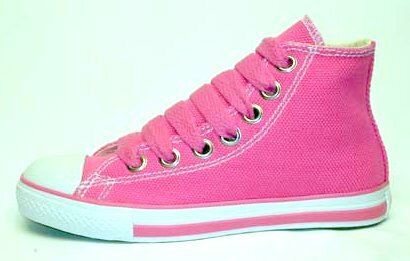 42 Simple Details High Top Chucks Outside view of a left pink simple details high top. 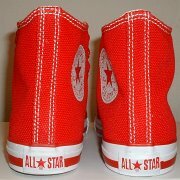 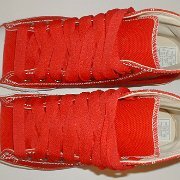 43 Simple Details High Top Chucks Inside patch view of a right red simple details high top. 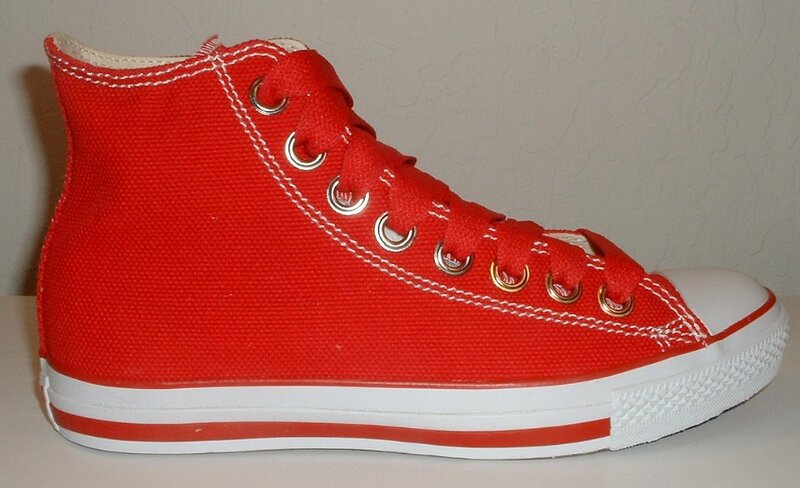 44 Simple Details High Top Chucks Outside view of a right red simple details high top. 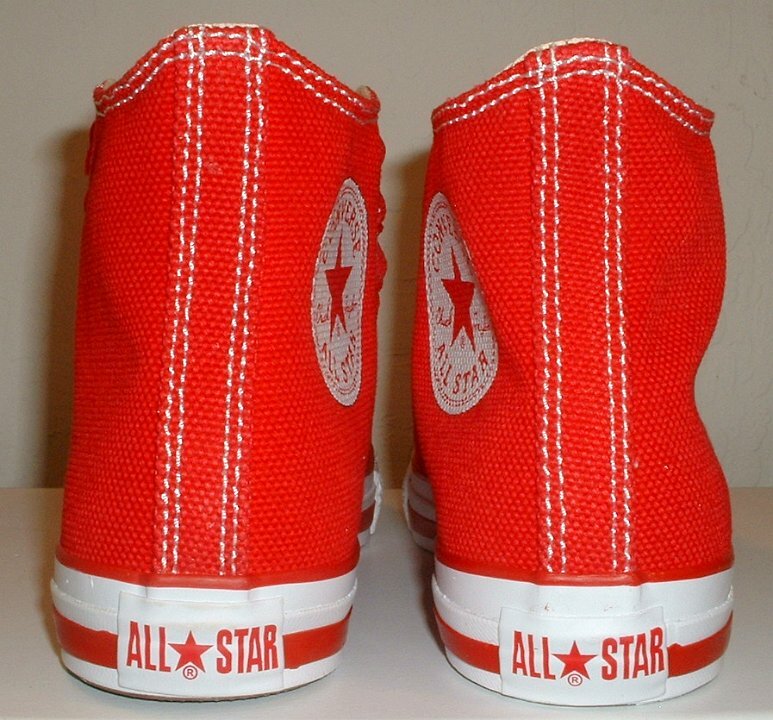 45 Simple Details High Top Chucks Inside patch view of a left red simple details high top. 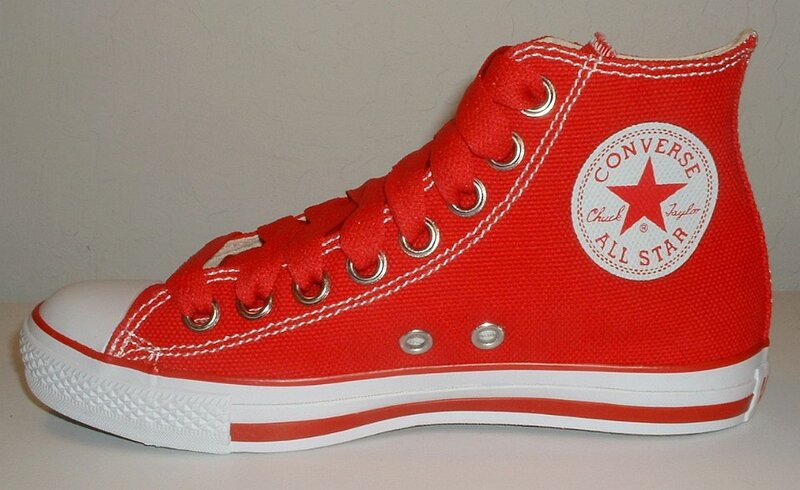 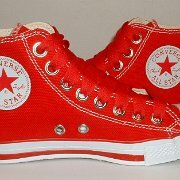 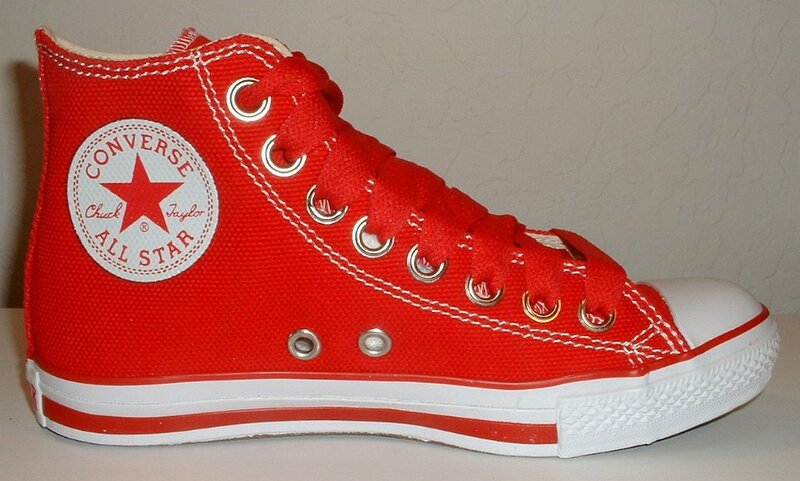 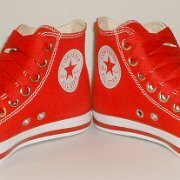 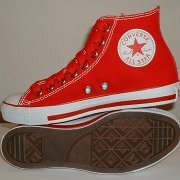 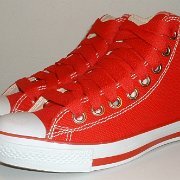 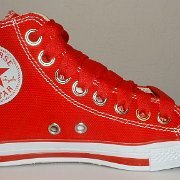 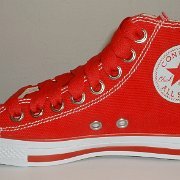 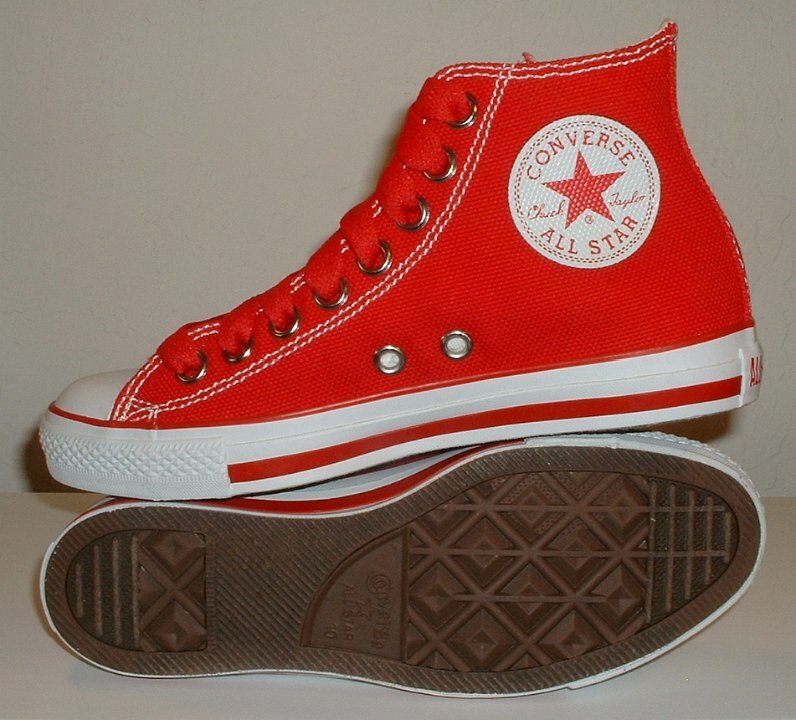 46 Simple Details High Top Chucks Outside view of a left red simple details high top. 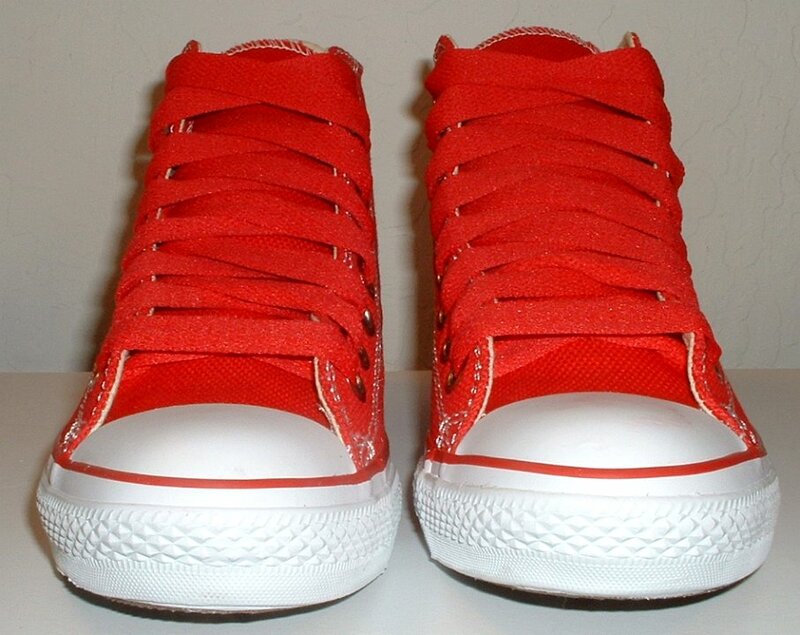 47 Simple Details High Top Chucks Rear view of red simple details high tops. 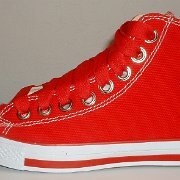 48 Simple Details High Top Chucks Front view of red simple details high tops. 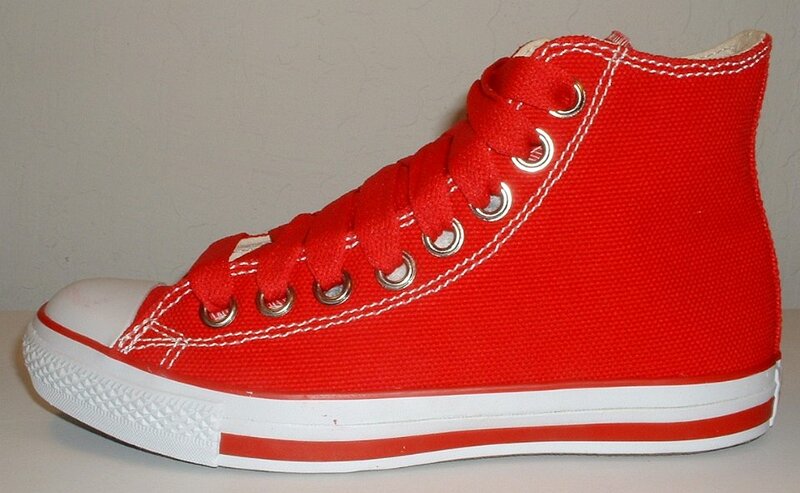 49 Simple Details High Top Chucks Angled side view of red simple details high tops. 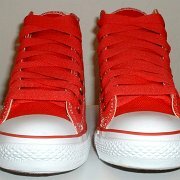 50 Simple Details High Top Chucks Top view of red simple details high tops. 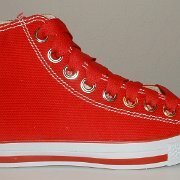 51 Simple Details High Top Chucks Angled front view of red simple details high tops. 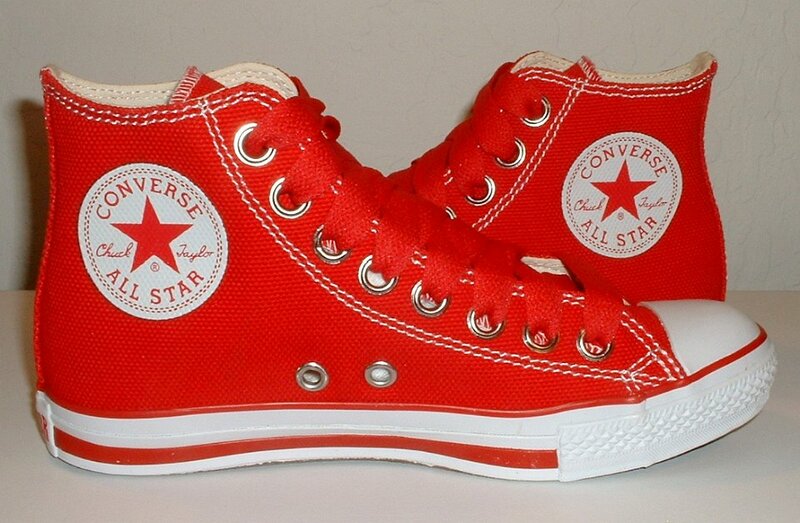 52 Simple Details High Top Chucks Inside patch views of red simple details high tops. 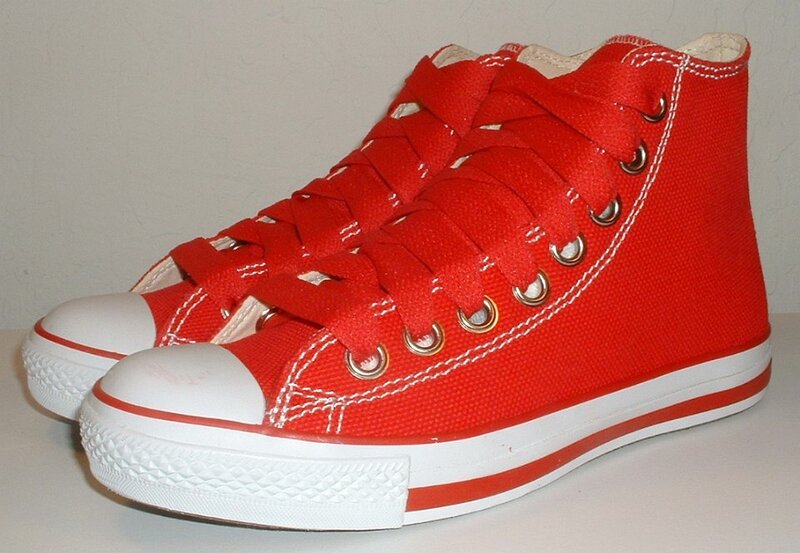 53 Simple Details High Top Chucks Inside patch and sole views of red simple details high tops. 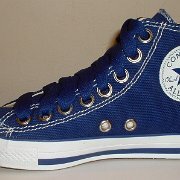 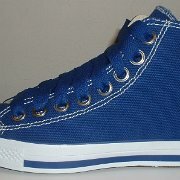 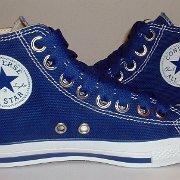 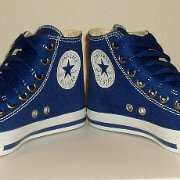 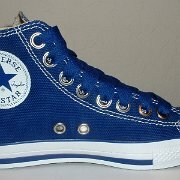 54 Simple Details High Top Chucks Inside patch view of a right royal blue simple details high top. 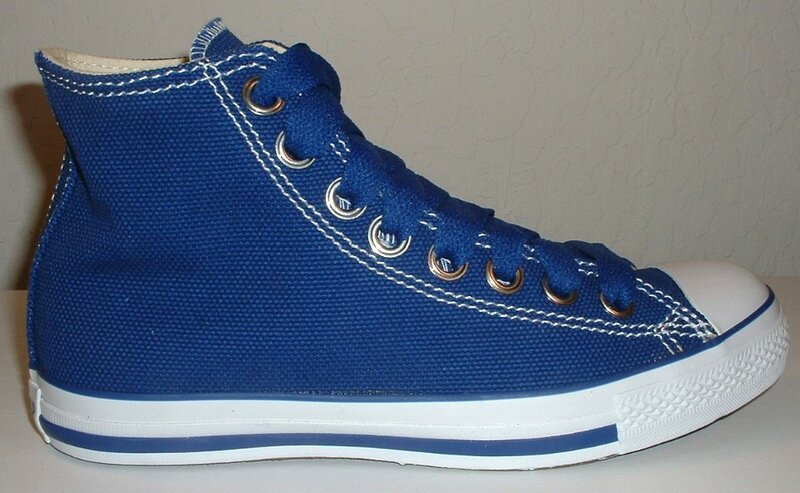 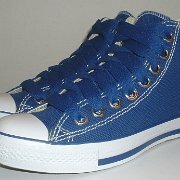 55 Simple Details High Top Chucks Outside view of a right royal blue simple details high top. 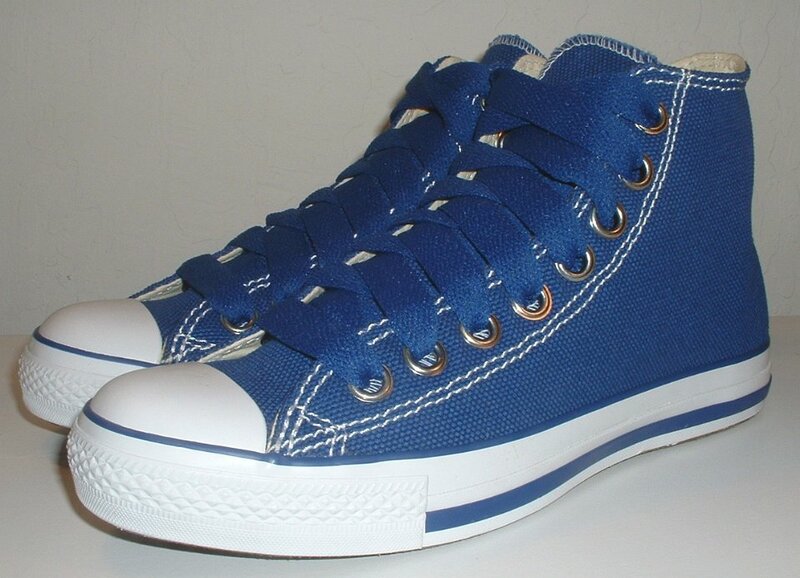 56 Simple Details High Top Chucks Outside view of a left royal blue simple details high top. 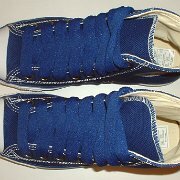 57 Simple Details High Top Chucks Inside patch view of a left royal blue simple details high top. 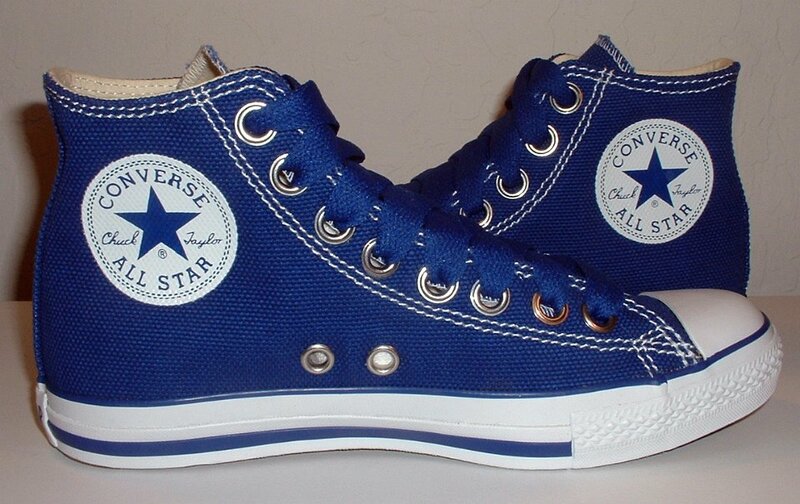 58 Simple Details High Top Chucks Rear view of royal blue simple details high tops. 59 Simple Details High Top Chucks Front view of royal blue simple details high tops. 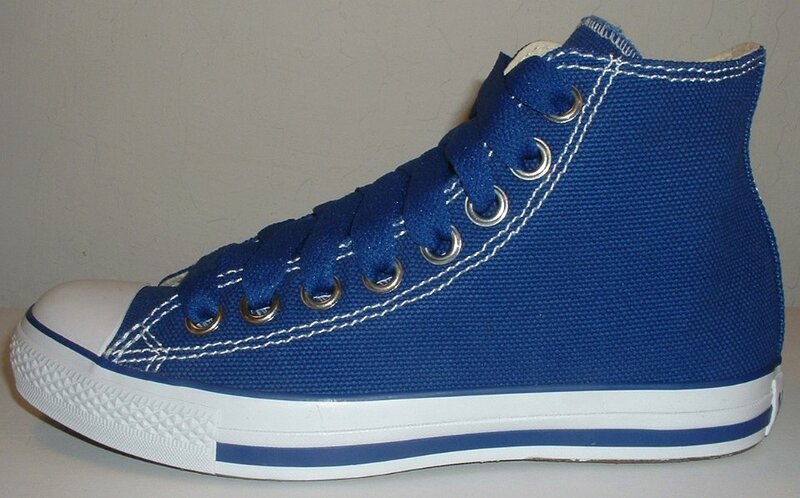 60 Simple Details High Top Chucks Angled side view of royal blue simple details high tops. 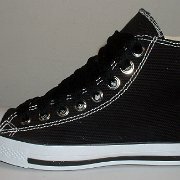 61 Simple Details High Top Chucks Angled front view of black simple details high tops. 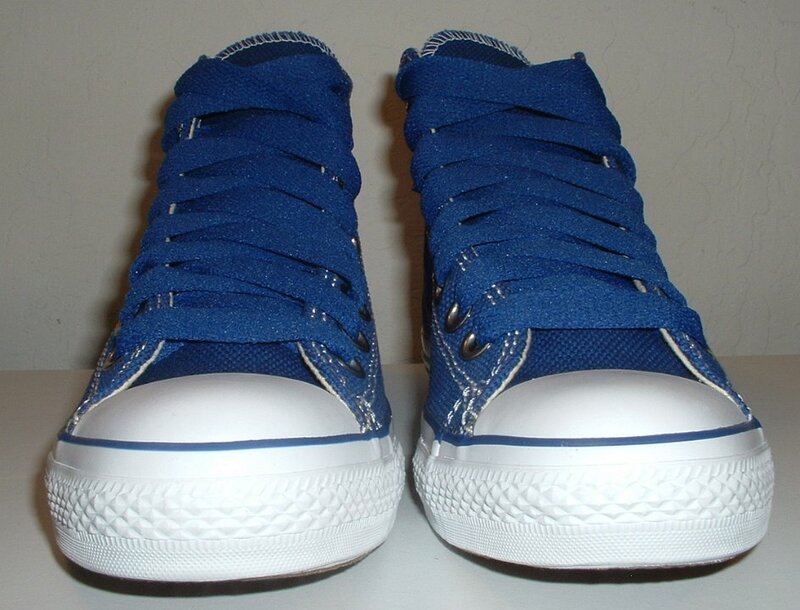 62 Simple Details High Top Chucks Top view of royal blue simple details high tops. 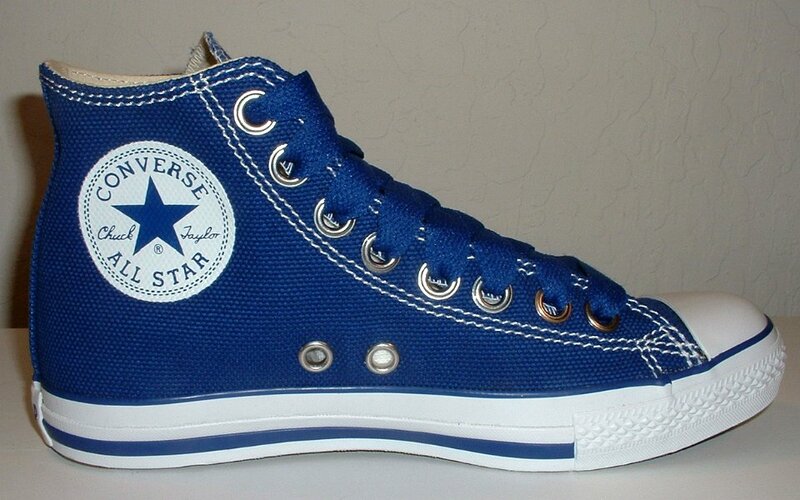 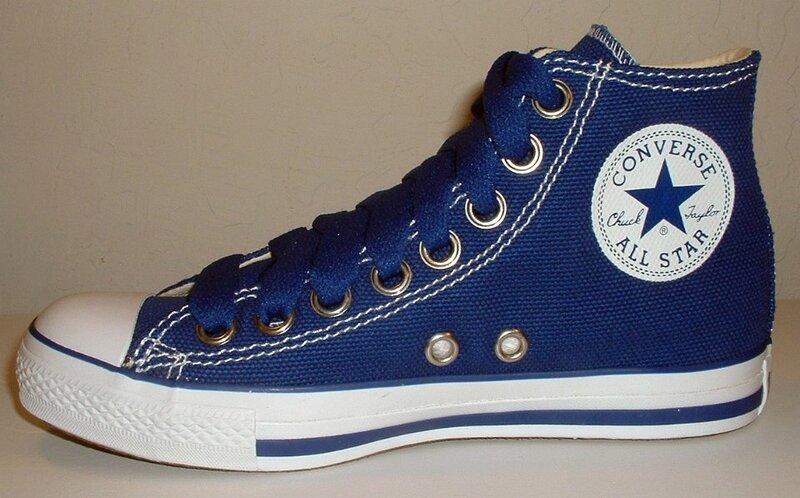 63 Simple Details High Top Chucks Inside patch views of royal blue simple details high tops. 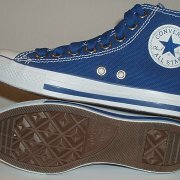 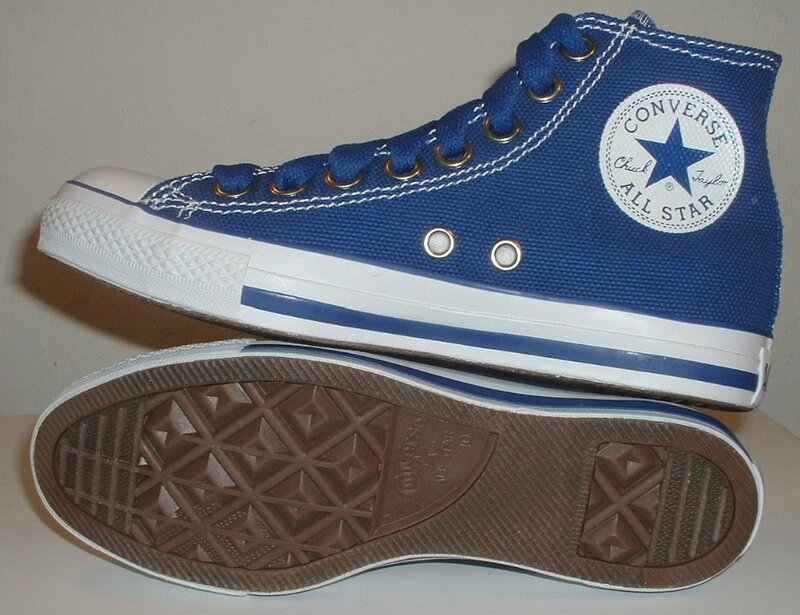 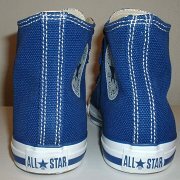 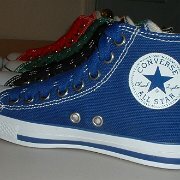 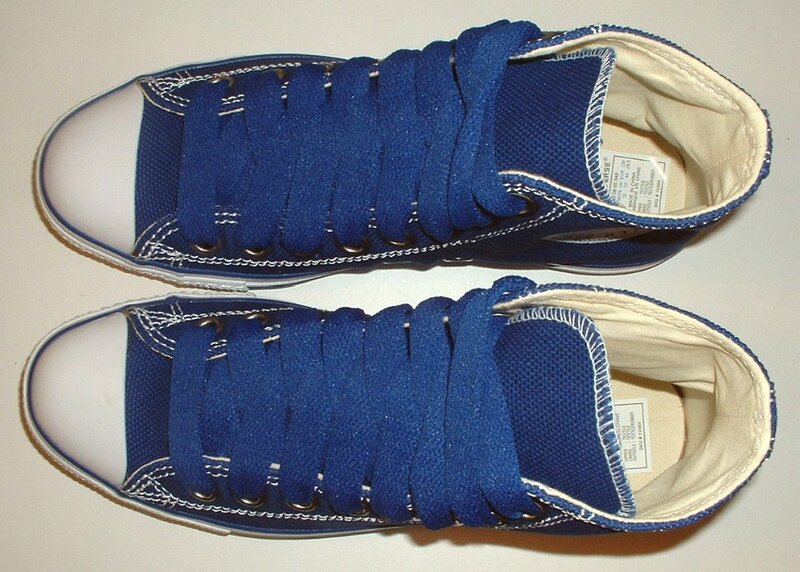 64 Simple Details High Top Chucks Inside patch and sole views of royal blue simple details high tops. 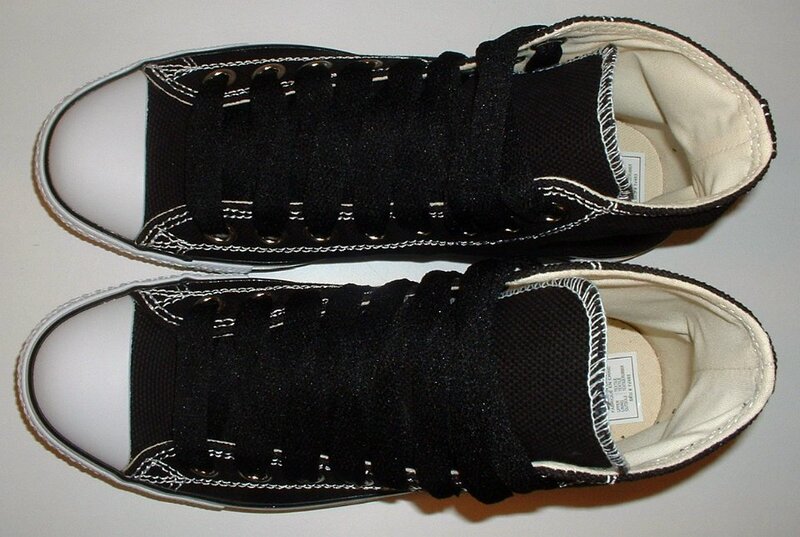 Simple details chucks were introduced in 2006. 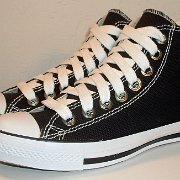 The term simple details refers to the simpler construction and single color used throughout each shoe. 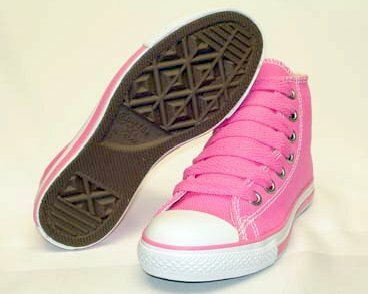 The shoes were introduced in high top and low cut. 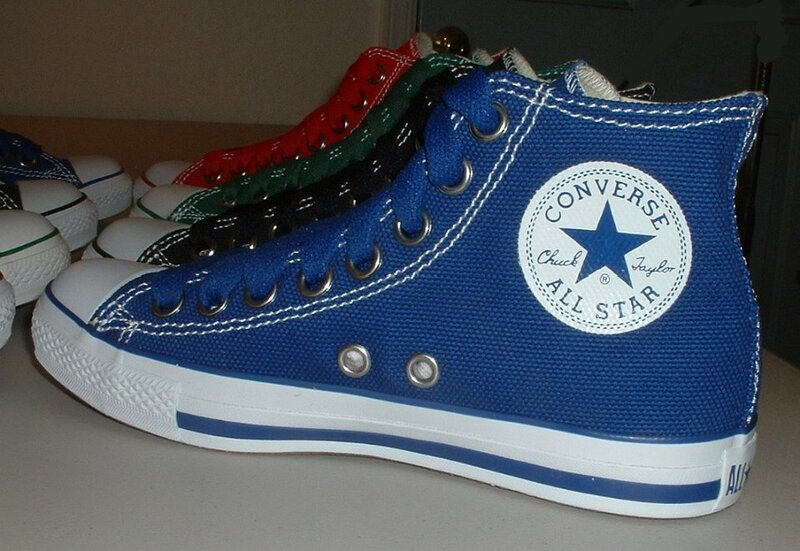 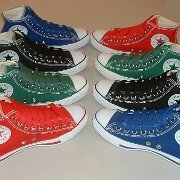 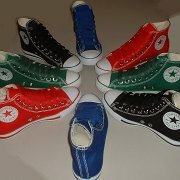 This gallery features the five high top models that were released -- black, red, royal blue, green, and pink. 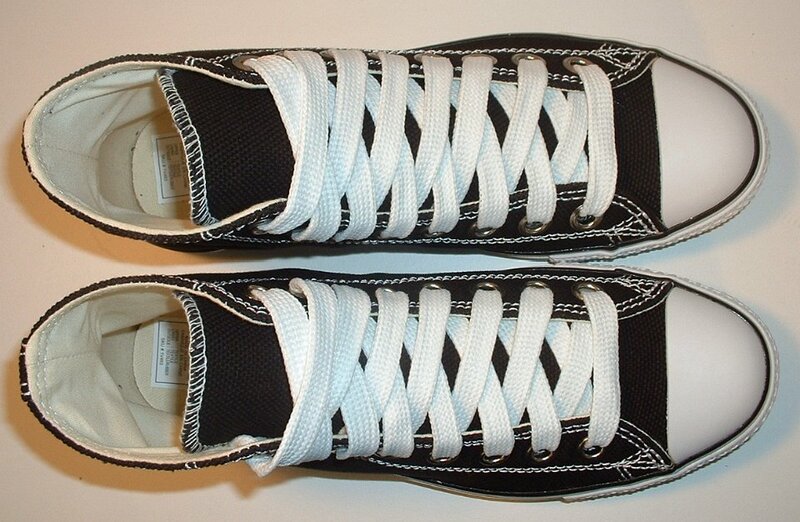 These shoes are designed for and come with wide laces. 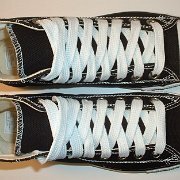 The eyelet holes are bigger to accommodate wider laces and even the ventilation eyelets are of this larger size. 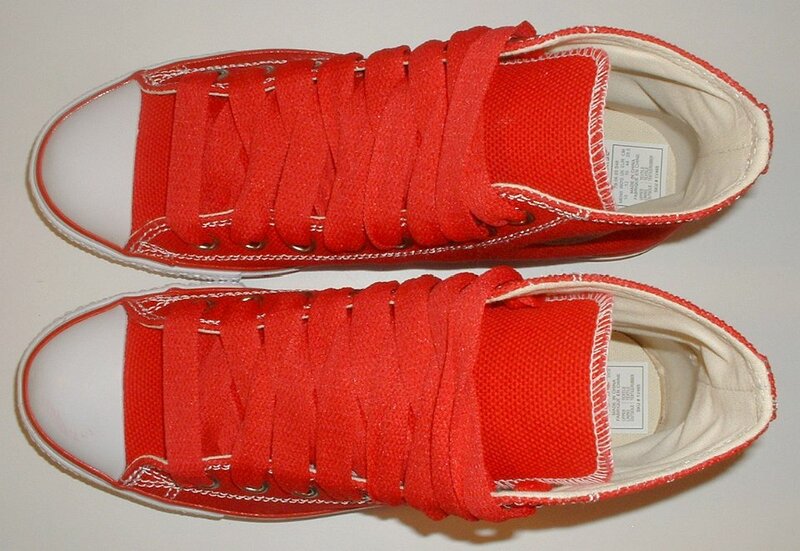 The laces match the color of the shoe. 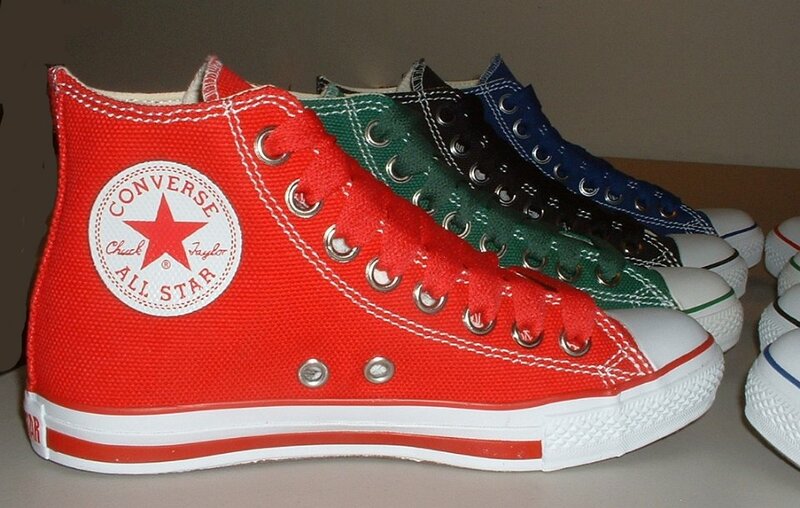 The uppers are made of a heavy textile material very much like hemp. 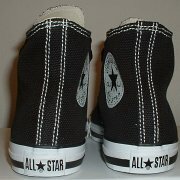 The texture of the uppers is a heavy dotted type of fabric. 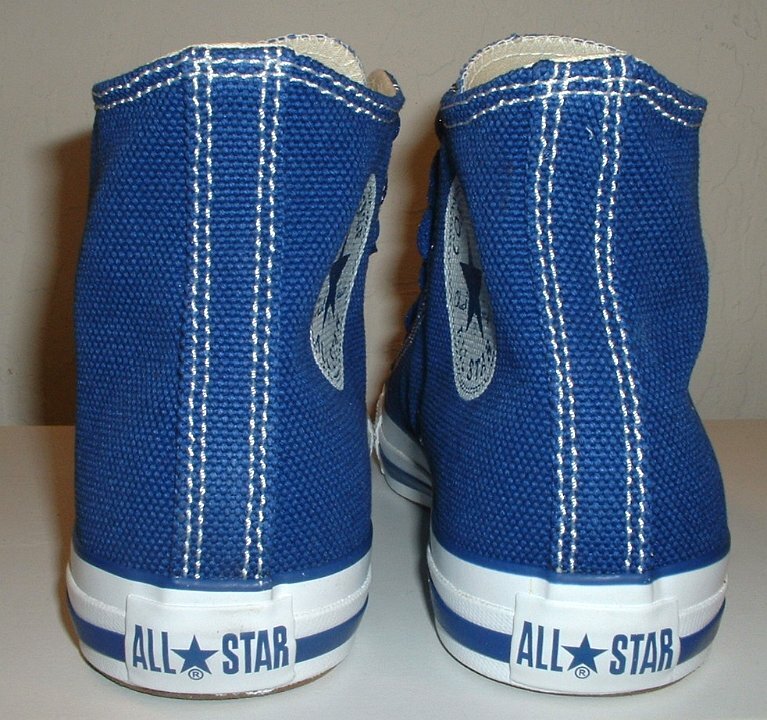 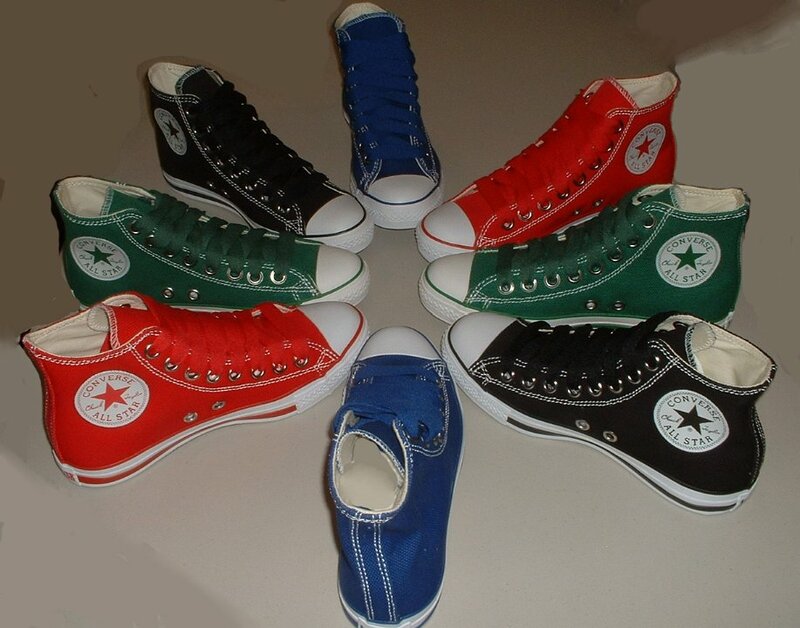 The ankle patch is much bigger than the traditional Chuck Taylor ankle patch and it is printed all in the basic color of each shoe. 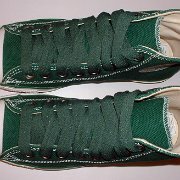 All the piping is also the same color, and the piping on the outer sole is a very wide bold stripe. 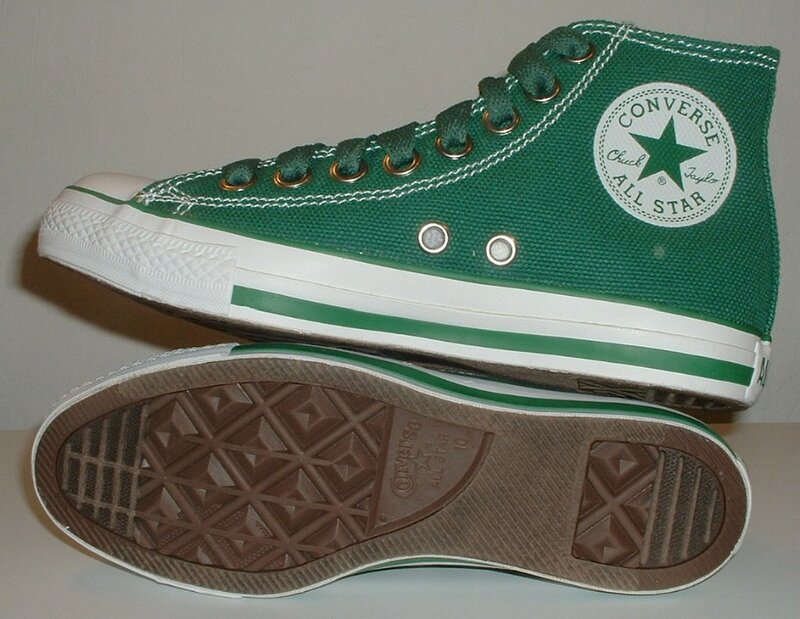 Even the word "Converse" printed in the inner sole is the same color as the upper of the shoe.